At some point in the early 1960s, a classmate on the playground yelled at me, “Your mother wears combat boots!” I don’t remember why this child said such a silly thing. If it was meant as an insult, I didn’t take it as one. * My mother served in the Army before I was born, so I reasoned she could have worn combat boots. I put it out of my mind at the time and returned to more important matters, like passing around “The Outer Limits” trading cards or admiring someone else’s Rat Fink ring. I ignored that remark for the same reasons I ignored those who called me an Army brat: It made no sense, and I had been taught to pick my battles. With Mother’s Day coming up, I’ve naturally been thinking more about my mom. 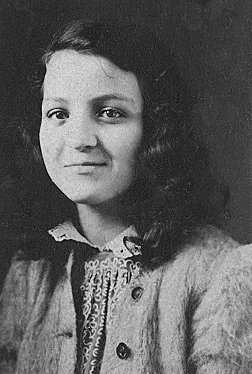 Audrey Agnes Salerno was born in 1927 in Peoria, Illinois to an Italian-immigrant father and an Irish-American mother. She was taught to love babies and food and how to hunt four-leaf clover. She’s been gone nearly thirty years now, and since I can’t thank her in person, I thought I would share with the cyberworld a little of what she passed on to me from what she learned in her early life. She laughed a lot and taught us to do the same. She often said, “I’m not laughing at you, I’m laughing with you,” and so we learned to laugh at ourselves, as well. 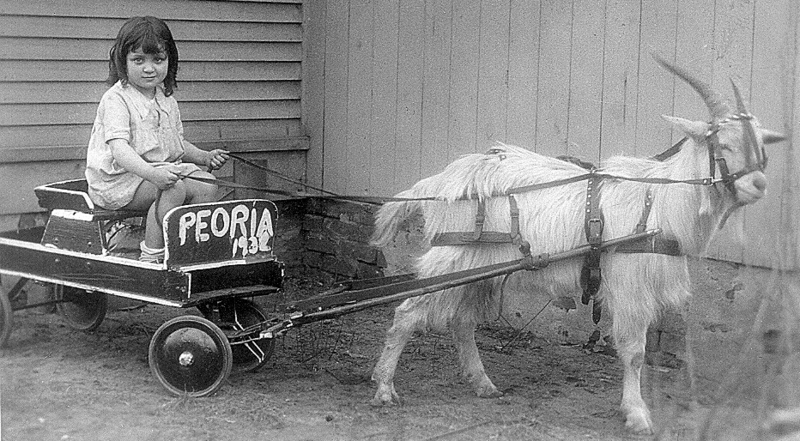 When a traveling photographer brought his goat and wagon to my grandma’s door one summer day, he snapped a photo of my 4-year-old mother wearing a somewhat sly expression. Perhaps she was already planning her next practical joke – something she was very good at in her adult years. As a child, my mother often jumped off her porch roof to strengthen her arms for flying. This is the kind of active imagination she encouraged in her own children (but the pursuit of flight was, oddly, discouraged). With her guidance, I could read by the time I was four years old. She filled our home, our birthday presents, and our Christmas stockings with books. And a gift of a secondhand manual typewriter bridged the gap between my imagination and the stories waiting to flow from my fingertips. The Great Depression was a great equalizer. Every country in the world was affected by it. The Salerno’s had it better than some in the 1930s, living in a house that was paid for (built by my great-grandfather) with a yard big enough to grow fist-sized tomatoes and multi-colored bell peppers. Times were still tough — even though she was hungry, my mom couldn’t eat dinner the night my grandma made stew from her pet rabbit. When she had her own children, she made sure we had warm coats in the winter and shoes that fit, and always, always, had food on the table. Because of her I learned to be resourceful, grateful for what I had, and to never waste a crumb of anything. My mom taught us the importance of our words and how they affect others. She didn’t gossip, didn’t allow it spoken in the house, and she lived by the rule, “if you can’t say something nice about someone, don’t say anything at all.” You would think with all that crazy Irish-Italian blood running through her veins she would have been hot-headed, but she was just the opposite. She held her temper like no one else could. She was also an expert at holding on to a secret. I was a teenager before she let slip she never received a high school diploma. She was 16 years old in 1944 when the world was at war. She grew tired of spending her days in classrooms with “children” much less mature than she and tired of watching life pass her by. Quitting school just seemed the right thing to do. Shy and introverted, she still believed she could do anything she put her mind to. 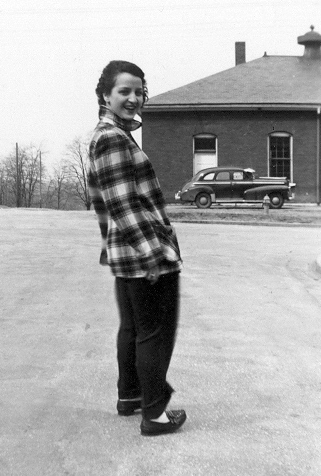 Though she had no skills, she landed a job as a clerk with the Peoria Journal/Star. 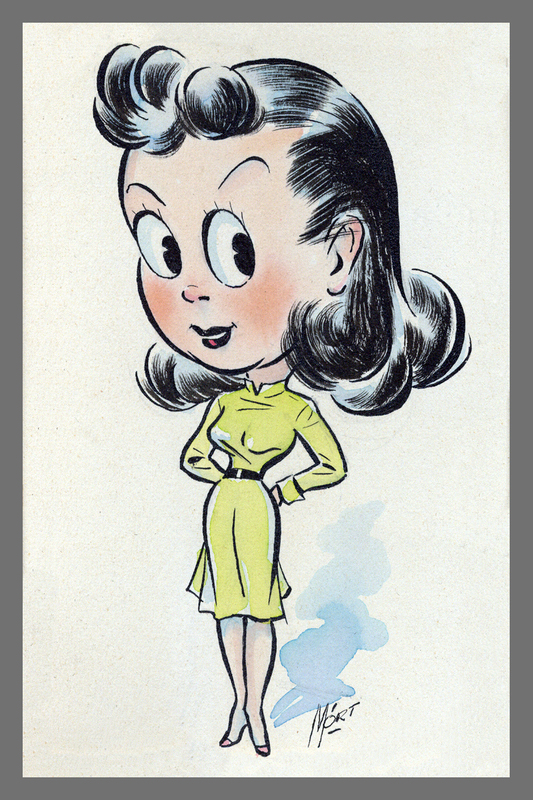 It wasn’t long before the newspaper’s cartoonist Mort Greene became enamored of her, evidenced by gifts of hand-drawn cards, poetry, candy and flowers. Other young women might have jumped at the chance at romance, but my mom had set her mind on something else. 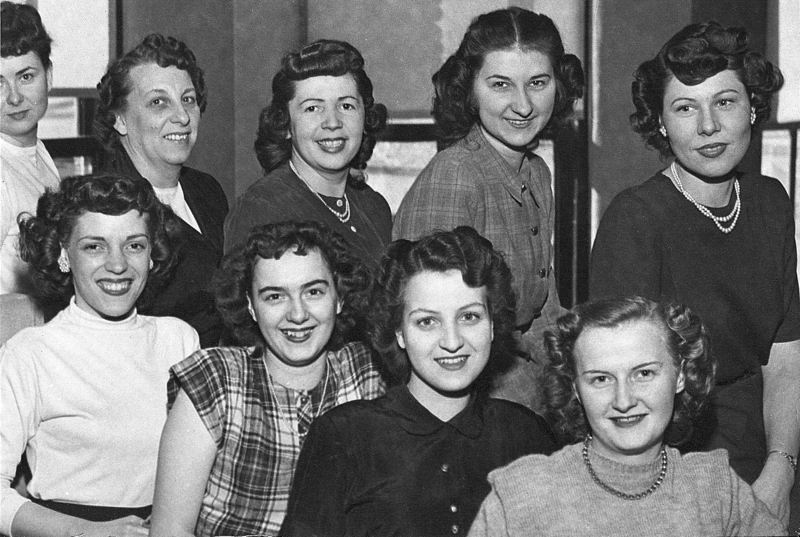 She enrolled in school again, and by the end of 1948 she had received a General Education Development (GED) certificate from Manual Training High School. The war was over by then, but patriotism was still high. 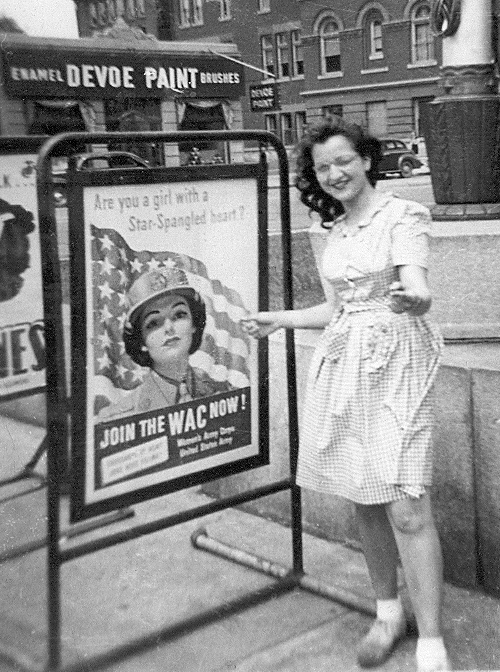 Women’s Army Corps (WAC) posters asked, “Are you a girl with a Star-Spangled heart?” She enlisted in 1949, at the age of 21, and went to stenographer’s school. My mom had many suitors in the Army, but it was my dad’s sense of humor that won her over. Within a year of enlisting she had fallen in love with that young Sergeant in the Signal Corps. 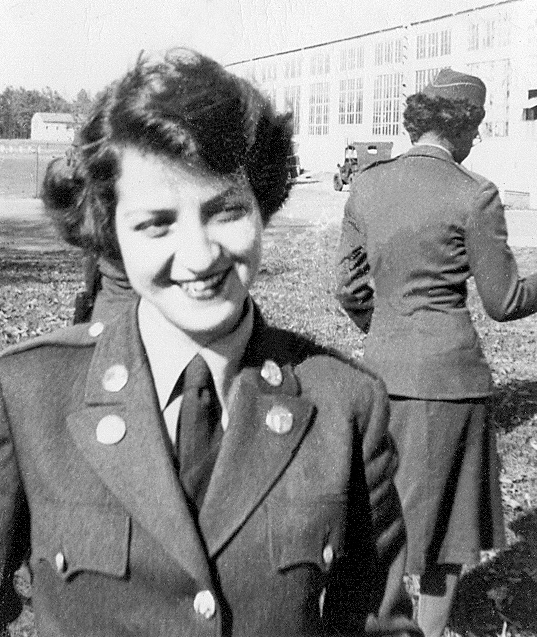 At the time, women couldn’t stay in the Army after getting married, so PFC Audrey A. Salerno was honorably discharged three days after the ceremony. Today some would bristle at that, but my mom knew her heart and it was the right choice for her. A few days before my mother’s death at the age of 58, I thanked her for being a wonderful mom and asked if she ever regretted giving up her future to raise us. She told me she considered it an honor to be a mother, there was nothing else she would rather have spent her life doing. Of all the things she taught me by example, learning the importance of responsibility and sacrifice has served me the most over the years. What did you learn from your mom? If any of you had a mother in the military, I’d love to hear her story. And if you recognize someone in these photographs, please leave a comment. *As it turns out, that child really was trying to insult me, but I like to think he was just passing on what he heard someone else say and had no idea what it meant. Urbandictionary.com says this about that playground taunt: During WWII, prostitutes who followed the troops around, sometimes wore army boots or combat boots. 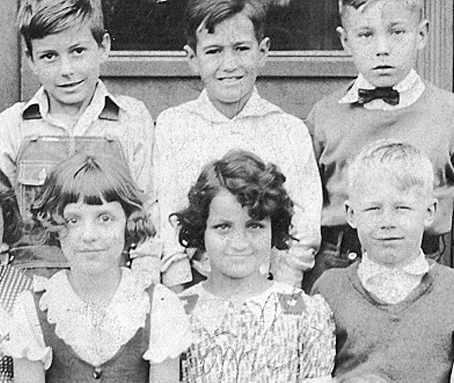 This entry was posted in Musings and tagged 1920s, 1930s, 1940s, 1950s, Audrey Salerno, baby boomers, be grateful, Camp Lee, combat boots, Ft Leavenworth, Garfield Elementary, gratitude, Great Depression, lessons from life, Manual Training High School, Mort Greene, Mother's Day, Peoria Illinois, Peoria Journal Star, Rat Fink ring, star-spangled heart, The Women's Army Corps, traveling photographer, WAC, women in the military, World War II by Cate Macabe. Bookmark the permalink. I am looking for info on my aunt, !st. 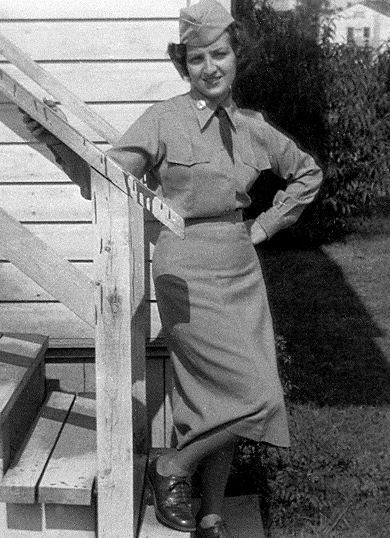 Lt. Anne E. Maris, who was wounded on Qct. 29, 1945 at Lingayen, Philippines. Possible they served together? Thanks. I’m sorry, my mom never served overseas and I don’t have information about who her friends might have been back then. Good luck in your hunt! A lovely memoire, Cate. You were very lucky to have such a special mum. Especially interesting that multi-talented, Oscar-nominated lyricist, cartoonist, gag writer (etc.) Mort Greene could have been your father! I never wondered “what if” Mr. Greene had been my father. I probably would have had a more interesting life… Thanks for stopping by! Thank you for sharing so many wonderful things about your mom. I really enjoyed your post.